September will forever remind me of Hatch Pepper season in New Mexico and Texas. Much like the nostril tingling smell of burning leaves in the fall, the air becomes heady with the nostalgic scent of roasting chile peppers. I felt the need to honor the season by roasting my own poblano peppers―not quite the same as Hatch peppers, but good enough. 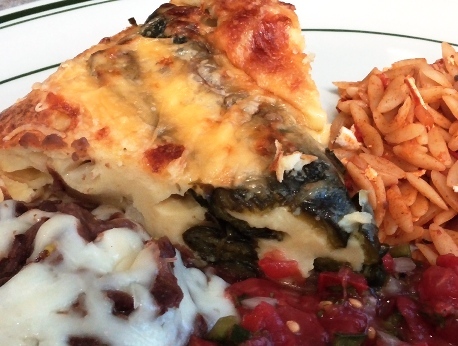 I’ve also written here about my endless tinkering with cheese stuffed peppers and my obsession with new variations on chile rellenos―something beyond egg batter dipped and fried. Since we have a growing Latino community here, I was thrilled to find a market with a cheese counter selling bunches of long thick strands of Oaxacan quesillo. The cheese is quite similar to Italian string cheese, which would also work using multiple strands. Cut into appropriate lengths, the widths handily fit into a roasted chile. 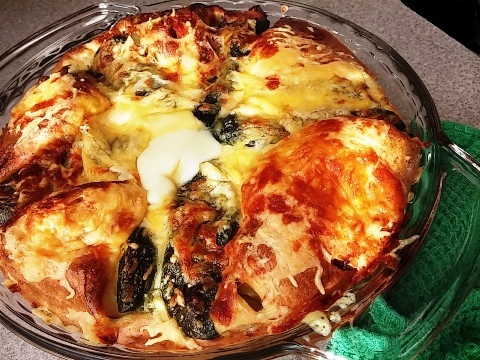 Today’s version is a take on the charming British Toad-in-a- Hole, or sausage encased in Yorkshire pudding. I’ve always had a special weakness for these babies, but balk at their soufflé-like tendency to sadly deflate into nothingness. I remedied that situation and now have a puffed and perky pepper oozing with melting cheese. It cuts into tidy wedges; no muss, no fuss. Not exactly Latino influenced, but still, it is quite tasty with fresh homemade salsa. Of course, what isn’t more tasty with salsa? Sear the chiles over a hot flame or broiler until blistered on all sides. Place in plastic bag to loosen skin. When cool, peel the skin away. Make a slit in the side of each and remove the stems and seeds, keeping them as whole and intact as possible. Set aside. Slice the cheese into 6 – 2 ½” lengths and wrap the peppers around the cheese fingers. .Meanwhile prepare the batter: combine the flour and salt in a medium bowl and make a well in the center. Combine the beaten eggs and milk and pour into the flour mixture, beat until well blended. Fold in half of the shredded cheese. Remove the onion from the oven and set the peppers into the dish like spokes in a wheel, wide ends out, with onions between the chiles. While the dish is still hot, quickly pour in the egg batter and return to oven; it will not completely cover the chiles. Reduce heat to 425 degrees and bake until it is puffy, about 15 minutes. Remove and sprinkle the remaining cheese over the top. Return to oven and bake another 10 minutes,, until it is inflated, the cheese melts, and the top is firmly set and it is taking on color; a total of 20- 25 minutes. Serve immediately, while fully raised. It will deflate somewhat but will remain puffy. It is also good served at room temperature. Serves 4 or more.